Hyrax is the common name for any of the largely herbivorous mammals comprising the order Hyracoidea, whose modern members are characterized by thickset bodies, short tails, and three-toed hind feet with rounded, hoof-like nails on two of the toes and a claw on the third. These mammals, which can be described as having a guinea pig or woodchuck-like body, and are similar in size to a large rabbit, are also known as cories and dassies. The presence of specialized muscles in the soles of the feet, combined with the soft and elastic nature of the sweat-gland moistened soles, helps to create a suction-like friction with rocks and other substrate, making them agile climbers. 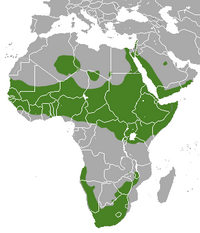 There is one extant family of hyraxes, Procaviidae, distributed only in Africa and the Middle East. Four species are recognized: the rock hyrax (Procavia capensis), the yellow-spotted rock hyrax (Heterohyrax brucei), the western tree hyrax (Dendrohyrax dorsalis) and the southern tree hyrax (Dendrohyrax arboreus). However, in evolutionary history hyraxes were more diverse, and with larger and smaller representatives, and for many millions of years they were the primary terrestrial herbivore in Africa. Hyraxes are often mistaken for rodents, but are more closely related to elephants. Hyraxes provide diverse values for the ecosystem and for humans. As part of food chains, they consume many tree, shrub, and grass plant parts (leaves, petioles, twigs, shoots, fruits, seeds) and occasionally insects, while being consumed by birds of prey (eagles, owls), large cats (lions, leopards), jackals, snakes, and mongooses. Hyraxes form the almost exclusive diet of Verreaux eagles. Hyraxes also disperse the seeds of fruits they eat and play a role in nutrient cycling. For humans, hyraxes have been hunted for food and fur and their crystallized excrement has been used by Europeans and African tribes to treat various illness (epilepsy, hysteria, convulsions) and as vitamin supplements. Hyraxes are well-furred, short-tailed, rotund animals about the size of a large rabbit. Typically, they measure between 30 and 70 centimeters (12-28 inches) long and weigh between 2 and 5 kilograms (4-11 pounds). Hyraxes have 3-toed hind feet with two of the toes with rounded nails that resemble hooves, while the inner toe has a claw. Forefeet have four or five toes. The soles of the fore- and hindfeet are soft, elastic, rubbery like pads, moistened by numerous specialized sweat glands, which increases friction and help the animal maintain its grip when quickly moving up steep, rocky surfaces. The soles of the feet also have specialized muscles in this regard, which helps the soles to work somewhat like suction cups. The plane of symmetry of the feet goes through the third digit (Myers 2000). Hyraxes have skulls with a short rostrum and prominent postorbital processes. They have a single incisor on each side of the upper jaw and two on the lower. Like rodents, the incisors grow continuously throughout life, and the presence of enamel on only one side (the anterior surface) creates a self-sharpening cutting edge. The molars have strongly developed lophs. Unlike most other browsing and grazing animals, they do not use the incisors at the front of the jaw for slicing off leaves and grass, rather, they use the molar teeth at the side of the jaw. There is a small diastema between the incisors and the cheek teeth. The dental formula for hyraxes is (Myers 2000). Although not ruminants, hyraxes have complex, multi-chambered stomachs that allow symbiotic bacteria to break down tough plant materials; their overall ability to digest fibers is similar to that of the ungulates (von Engelhardt et al. 1978). Their mandibular motions have often been described as chewing cud (Hendrichs 1966), although there is no evidence this behavior is associated with the regurgitation of stomach contents (Sale 1966b) as in the even-toed ungulates and some of the macropods. This behavior is referred to in a passage in the Bible (Leviticus 11:5), which describes hyraxes as chewing the cud. Hyraxes also have efficient kidneys, retaining water so that they can better survive in arid environments. Hyraxes retain a number of primitive mammalian characteristics; in particular, they have poorly developed internal temperature regulation, which they compensate for by behavioral thermoregulation such as huddling and by basking in the sun. Hyraxes inhabit rocky terrain, forests, and moist savannah across sub-Saharan Africa and the Middle East. The rock hyrax (Procavia capensis) occurs across sub-Saharan Africa, with the exception of the Congo basin and Madagascar. The western tree hyrax (Dendrohyrax dorsalis), is found in West and Central Africa: Benin, Cameroon, Central African Republic, Republic of the Congo, Democratic Republic of the Congo, Ivory Coast, Equatorial Guinea, Gabon, Gambia, Ghana, Guinea, Guinea-Bissau, Liberia, Nigeria, Rwanda, Senegal, Sierra Leone, Sudan, Togo, Uganda, and possibly Niger. The southern tree hyrax (Dendrohyrax arboreus) is found in Angola, Democratic Republic of the Congo, Kenya, Mozambique, South Africa, Tanzania, and Zimbabwe. Heterohyrax brucei, the yellow-spotted rock hyrax or bush hyrax, is found in Angola, Botswana, Burundi, Democratic Republic of the Congo, Southern Egypt, Eritrea, Ethiopia, Kenya, Malawi, Mozambique, Rwanda, Somalia, Northern South Africa, Sudan, Tanzania, Uganda, Zambia, and Zimbabwe. Some species are arboreal (the western tree hyrax and southern tree hyrax) and some live on rock outcrops (rock hyrax and yellow-spotted rock hyrax). While southern tree hyraxes are arboreal, and tend to live in dens created in trees and feed primarily in trees, there are reports of them sometimes occupying rocks (Williams 2004). Hyraxes are agile climbers and quick, and active during the daylight hours. Arboreal hyraxes tend to be solitary while those dwelling in rock outcrops tend to live in colonies (Myers 2000). Feeding is often in short, concentrated periods during the day, limiting their exposure to predators. Hyraxes living in small family groups are dominated by a single male, who aggressively defends the territory from rivals. Where there is abundant living space, the male may dominate multiple groups of females, each with their own range. The remaining males live solitary lives, often on the periphery of areas controlled by larger males, and mate only with younger females (Hoeck 1984). The words "rabbit," "hare," or "coney" appear as terms for the hyrax in some English translations of the Bible. Early English translators had no knowledge of the hyrax (Hebrew שָּׁפָן shaphan),and therefore no name for them. There are references to hyraxes in the Old Testament (Lev 11:4-8; Deut 14:7; Ps 104:18; Prov 30:26) and notably Leviticus 11 in which they are described as lacking a split hoof and therefore being not kosher. It also incorrectly claims that the hyrax chews its cud. Some of the modern translations refer to them as rock badgers. Phoenician sailors visiting the coast of Spain circa 1100s B.C.E., mistaking the European rabbit for the rock hyrax from their native homeland, gave it the name i-shepan-ham. A theory exists that an adaptation and/or corruption of this name, used by the Romans, became Hispania, leading to Spanish España and English Spain, although this theory is somewhat controversial. Four extant species currently are recognized; the rock hyrax (Procavia capensis), the yellow-spotted rock hyrax (Heterohyrax brucei), the western tree hyrax (Dendrohyrax dorsalis) and the southern tree hyrax (Dendrohyrax arboreus). More species used to be recognized, but in the 2000s, taxonomists reduced the number of recognized species of hyrax. In 1995, there were eleven or more recognized species; in 2013, only four are recognized. The animals which are no longer recognized as species are regarded as subspecies of the recognized four. There are over 50 recognized subspecies and species, many of which are considered highly endangered (Shoshani 2005). The extinct meridiungulate family Archaeohyracidae, consisting of four genera of notoungulate mammals known from the Paleocene through the Oligocene of South America (McKenna and Bell 1997), is a group unrelated to the true hyraxes. All modern hyraxes are members of the family Procaviidae (the only living family within the Hyracoidea) and are found only in Africa and the Middle East. In the past, however, hyraxes were more diverse, and widespread. The order first appears in the fossil record at a site in the Middle East in the form of Dimaitherium, 37 million years ago (Barrow et al. 2010). For many millions of years, hyraxes were the primary terrestrial herbivore in Africa, just as odd-toed ungulates were in North America. Through the middle to late Eocene, there were many different species (Prothero 2006), the largest of them weighing the same as a small horse and the smallest the size of a mouse. During the Miocene, however, competition from the newly developed bovids, which were very efficient grazers and browsers, displaced the hyraxes out of the prime territory and into marginal niches. Nevertheless, the order remained widespread, diverse, and successful as late as the end of the Pliocene (about two million years ago) with representatives throughout most of Africa, Europe, and Asia. The descendants of the giant hyracoids evolved in different ways. Some became smaller, and evolved to become the modern hyrax family. Others appear to have taken to the water (perhaps like the modern capybara), ultimately giving rise to the elephant family and perhaps also the sirenians. Hyraxes have highly charged myoglobin, which has been inferred to reflect an aquatic ancestry (Yong 2013). Hyraxes share several unusual characteristics with elephants and sirenia (manatees and dugongs), which have resulted in them all being placed in the taxon Paenungulata. Male hyraxes lack a scrotum and their testicles remain tucked up in their abdominal cavity next to the kidneys (Carnaby 2008; Sisson 1914)); the same as elephants, manatees, and dugongs (Marshall Cavendish 2010). Female hyraxes have a pair of teats near their arm pits (axilla), as well as four teats in their groin (inguinal area); elephants have a pair of teats near their axillae, and dugongs and manatees have a pair of teats, one located close to each of the front flippers. The tusks of hyraxes develop from the incisor teeth as do the tusks of elephants; in most other mammals, tusks develop from the canines. Hyraxes, like elephants, have flattened nails on the tips of their digits, rather than curved, elongated claws, which are usually seen on mammals. The small modern hyraxes share other features with elephants, such as toenails, excellent hearing, sensitive pads on their feet, small tusks, good memory, higher brain functions compared to other similar mammals, and the shape of some of their bones (BBC 2000). DNA evidence also supports the hypothesis of a close connection between hyrax, elephants, and sirenians. 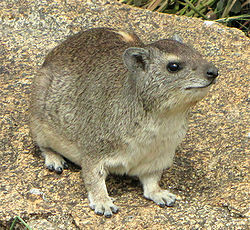 Hyraxes are sometimes described as being the closest living relative to the elephant (Economist 2009), although whether this is so is disputed. Recent morphological and molecular-based classifications reveal the sirenians to be the closest living relatives of elephants. While hyraxes are closely related, they form a taxonomic outgroup to the assemblage of elephants, sirenians, and extinct orders such as Embrithopoda and Desmostylia (Asher et al. 2003). Asher, R. J., M. J. Novacek, and J. H.. Geisher. 2003. Relationships of endemic African mammals and their fossil relatives based on morphological and molecular evidence. J. Mamm. Evol. 10: 131–194. Barrow, E., E. R. Seiffert, and E. L. Simons. 2010. A primitive hyracoid (Mammalia, Paenungulata) from the early Priabonian (Late Eocene) of Egypt. Journal of Systematic Palaeontology 8(2): 213–244. Received February 2, 2014. BBC TV. 2000. Hyrax: The little brother of the elephant. Wildlife on One Season 29, Episode 8, Air date Oct. 2, 2000. Retrieved February 2, 2014. Carnaby, R. 2008. Beat about the Bush: Mammals. Jacana Media. IBSN 9781770092402. Economist. 2009. The song of songs: A hyrax’s song gives a detailed account of his wares. The Economist January 15, 2009. Retrieved February 2, 2104. Hendrichs, H. 1966. Vergleichende untersuchung des wiederkauverhaltens (transl. Comparative investigation of cud retainers. Biologisches Zentralblatt 84(6): 671–751. Hoeck, H. 1984. Hyraxes. Pages 462-5 in D. Macdonald, The Encyclopedia of Mammals. New York: Facts on File. ISBN 0871968711. Marshall Cavendish Corp. 2010. Mammal Anatomy: An Illustrated Guide. Marshall Cavendish. ISBN 9780761478829. Retrieved February 2, 2014. Myers, P. 2000. Hyracoidea. Animal Diversity Web. Retrieved January 30, 2014. Prothero, D. R. 2006. After the Dinosaurs: The Age of Mammals. Bloomington, IN: Indiana University Press. ISBN 9780253347336. Sale, J. B. 1966a. The habitat of the rock hyrax. JE Afr. Nat. Hist. Soc. 25: 205-214. Sale, J. B. 1966b. Daily food consumption in the hyrax. JE Afr. Nat. Hist. Soc. 25: 215-224. Shoshani, J. 2005. Order Hyracoidea. In D. E. Wilson and D. M. Reeder, eds., Mammal Species of the World 3rd ed. Johns Hopkins University. ISBN 9780801882210. Sisson, S. 1914. The Anatomy of the Domestic Animals. W.B. Saunders Company. von Engelhardt, W., S. Wolter, H. Lawrenz, and J. A. Hemsley. 1978. Production of methane in two non-ruminant herbivores. Comparative Biochemistry and Physiology. Part A: Physiology 60(3): 309-311. Williams, A. 2004. Dendrohyrax arboreuseastern tree hyrax(Also: southern tree hyrax). Animal Diversity Web. Retrieved January 30, 2014. Yong, E. 2013. One protein shows elephants and moles had aquatic ancestors. National Geographic June 13, 2013. Retrieved February 2, 2013. This page was last modified on 11 May 2014, at 21:54.